S-style C is the basic model of new S-style series. The simple structure provides beautiful style and great quality! HKS S-style C was designed for those who want to enjoy the driving with family or friends with customizing cars. HKS S-style C can provide comfortable long distance driving even with a customized car. A mono-tube suspension structure was utilized for high durability, and provides comforts even in the harshest driving conditions. Shaft damage by rocks and pebbles from bouncing onto the shaft can be prevented. PNE Coating's corrosion resistance is 5 times as much as the galvanization's. This coating can protect against rust, and its smooth surface requires less force to adjust the ride height than conventional dampers. 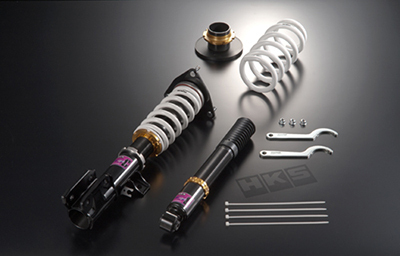 The "M-Shaft" which was designed for HKS HIPERMAX series' flagship model "M1" is also utilized. Enlarged cylinder diameter optimizes the oil pressure's characteristics and maintains the dampening even at subtle stroke range. Especially the M-Shaft on rear side improves the ride quality. Linear progression piston adjusts oil passages for precise stroke management resulting in smoother handling movements. As piston speed increases, dampening rate linearly increases. Ride quality of street driving can be improved. Durability is enhanced, and noise is reduced. * Some automobiles has options for pillow upper mount. The anti-rust and corrosion characteristics for enhanced durability are featured. Using these can trim weight below the spring.